The project brief was a request for a simple garden room and winter entrance to a textile workers cottage. The inspiration for the scheme comes from the steep topography of the site. 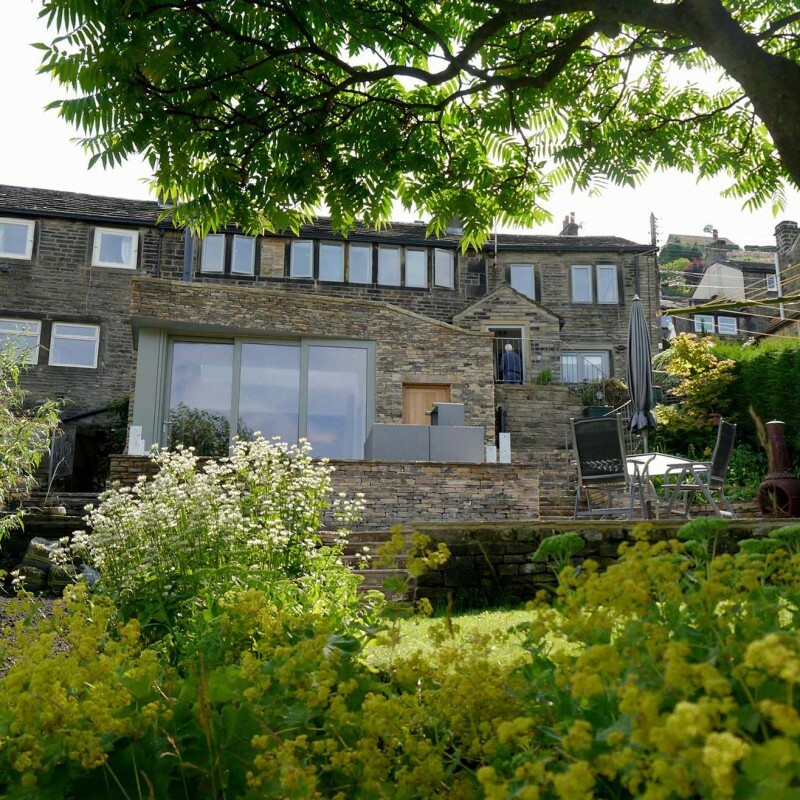 The building nestles into the hillside, being one storey from the street to three storeys high to the garden. We sought to enhance the existing series of terraced levels cascading down the hillside and augment them with the new addition. The new garden room extends a previous addition at the lowest level of the house. With the new addition we sought to really capitalise on the varied terrace levels but also to create a type of space not found anywhere else in the house.The roof level steps up creating a much higher internal space and forming an edge to the existing upper terrace. With such a prominent roofscape to consider, we struck upon the idea that the building should not look new but should almost appear to be ‘found’ within the landscape and subsequently hollowed out and inhabited. A stone roof is made with fissures of stone, plants and gravel. The glass rooflights reflect the sky in the same way as water pools in the moorland gritstone. A series of timber columns march from inside to out. The materials became a very simple palette of stone outside and plainer surfaces of plaster or timber internally. The stone cobbles of the roof mimic the historic stone slates of the traditional houses. The stone of the walls is laid to appear as a series of ancient dry stone walls. Importantly, the material has all been reclaimed from local sites and has the added benefit of instantly aging the building. The western corner of the building is carved out and filled by oversized sliding doors that open up to link inside spaces with the garden. From inside this glazed corner affords views across the Holme Valley and rooftops of the old textile mills. The depth of the column is designed to afford some privacy between neighbours whilst framing the long views. Eventually the timber posts and trellis wires will be subsumed by the dense foliage of a Wisteria.